Provides deep analytics based reports to understand the market & stock specific information. Attention: Indian Stock Market May be Volatile...!!! As you know from 1st July 2017, GST(Goods & Services Tax) is effective across India. GST is a great move by our current government. However, due to it's complex nature, business world is perplexed about the net impact. It's very hard to predict which sectors or companies will get positive or negative impact. Luckily, our Active Portfolio Service (APS) is going to work as a watchdog for you. Please ensure your subscription is active and not going to expire in next couple of weeks. 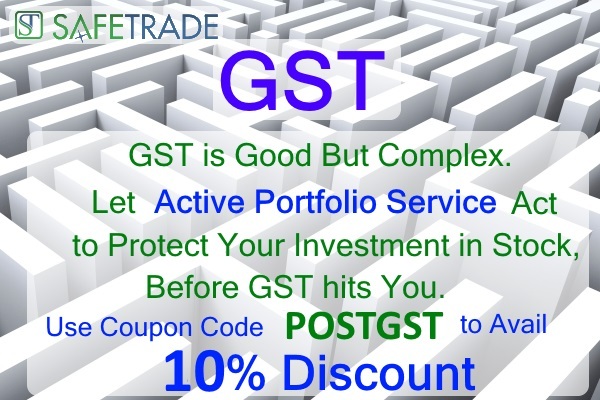 In case you want to subscribe to new portfolio or extend the existing one then use coupon code POSTGST to avail 10% discount. Offer Valid Till 10th July, 2017!